In the summer of 2005, I had Lasik eye surgery to correct an astigmatism which had been plaguing me since I was about 15 years old. While I was pregnant, my eyes got worse, and then I had an infant, and waking up "blind" 347 times a night just wasn't cutting it. So, I decided to take the risk,and have the surgery. I honestly have no complaints or regrets, in fact, it was one of the best decisions I have ever made. My eyes were B-A-D and I honestly love having the ability to see clearly. In fact, I still wake up some days amazed at the fact I can actually see the clock directly in front of my face.... after the surgery, I cried every day for a week straight when I woke up in the morning, opened my eyes, and could see. It was like a miracle (miracle of science... but, hey, a miracle is a miracle). It won't be long until I will most likely need reading glasses. 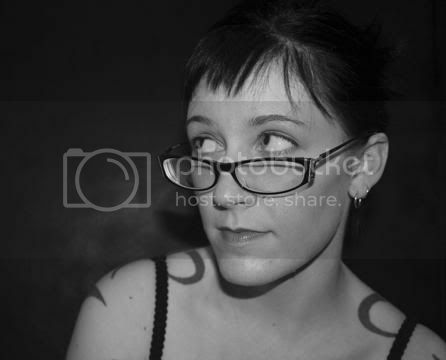 From the time of surgery, I figured I had a good 20-ish years (give or take five), before I would need glasses to see a menu, or read myself to sleep at night. And, at the time, when I was writing a check for the surgery (to the tune of $1500 an eye) those 20 years mattered. Though I don't miss having to take out contact lenses before going to bed (especially at faire), and I don't miss having to be sure my glasses were at hand as I fell asleep, or getting up to care for my kid in the middle of the night and forgetting to grab them because I was half asleep, I do miss the fashion statement they made. I know... I am not really what people think of when they think 'fashionista.' I'm pretty sure, when "Project Runway" comes on, my friends don't think "Giddy." But, I have always had my own odd personal fashion sense. There are times when I am sitting down to write, when I miss having my glasses... just because even with all the annoyance of being "blind," I really enjoyed the look. Gah... am I really so vein? Is it strange that I'm considering going out and buying a pair of glasses just for the look? Is it odd that I miss them so much? I feel like it seems strange... but I wore them for fifteen years... maybe its normal to feel strange to NOT wear them. Ps. 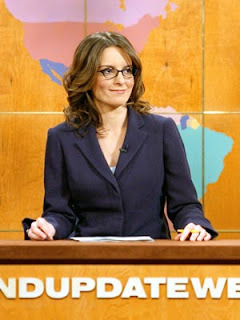 Yes, I love Tina Fey... would she be as funny without the glasses?